Bookseller Barnes & Noble is considering spinning off its Nook digital business to help it grow, following strong growth in sales of the Nook reader and tablet and digital content in the nine-week holiday period ending Dec. 31. Competition from the likes of Amazon.com, and investments in advertising and international business for the Nook may however be putting pressure on the company's margins. Barnes & Noble said Thursday it has decided to "pursue strategic exploratory work" to separate its Nook digital business, to capitalize on its rapid growth and its favorable position in the expanding market for digital content. "We see substantial value in what we've built with our Nook business in only two years, and we believe it's the right time to investigate our options to unlock that value," Barnes & Noble CEO William Lynch said in a statement. Barnes & Noble expects its Nook business will be about US$1.5 billion this fiscal year. It expects the business to continue to grow rapidly backed by continued growth in the U.S., and the opportunity to grow the Nook business internationally in the next 12 months. The company is already in discussions with strategic partners including publishers, retailers, and technology companies in international markets to expand the Nook business abroad. 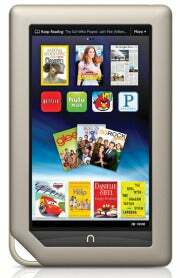 Sales of the Nook devices including the tablet in the nine weeks to Dec. 31 were up 70 percent over the same period in the previous year, with a substantial portion of these sales coming through third-party retailers, as the company expanded Nook distribution. The consolidated Nook business across all of the company's segments, including sales of digital content, device hardware and related accessories, increased 43 percent during the holiday period to $448 million, on a comparable sales basis. The company's brick-and-mortar store sales in contrast grew by only 2.5 percent during the period to $1.2 billion. Barnes & Noble expects full fiscal year 2012 consolidated sales of between $7.0 billion and $7.2 billion, down from an August forecast of $7.4 billion. Full year earnings before interest, taxes, depreciation and amortization (EBITDA) are expected to be in a range of $150 to $180 million, lower than forecast by the company in December. The company said its change in guidance is due primarily to a shortfall in sales of Nook Simple Touch, its black-and-white reader, as well as additional investments in growing the Nook business, such as in advertising to support new products and for international expansion in the back half of the year. It said it over-anticipated the growth in consumer demand for single purpose, black-and-white reading devices in the holiday.